Why: For the first time ever, Dr. John Long Middle School is hosting an open house-style Maker Mania Night to showcase student-made Makerprojects. This event will give students an opportunity to show off the work they’ve done to parents, fellow students, and the community. How: Students will have informational displays set up at booths throughout the space. Attendees can visit each booth to learn more about the work that the students have done on their projects. Each student has worked though the engineering cycle to solve problems related to their purpose in a subject unfamiliar to them previously. The projects are related to Maker Faire, an international celebration of invention, creativity, and curiosity, showcasing the very best of the global Maker Movement—where people of all ages and backgrounds gather to learn, share, play, and make. These types of events have been held in Dubai, Paris, Bangkok, and locales all over the world. Land O’ Lakes, FL – (December 13, 2018) – Pasco County Schools recently was notified that the Community Foundation of Tampa Bay approved $40,000 in grant funds for a project that seeks to improve teacher and leader professional learning with the goal of greater student outcomes. The Investing in Teaching and Leading Excellence for Greater Student Achievement Project will support a Pasco Standards Summer Institute through the district’s Pasco Partners group as well as external partners TNTP and UnBoundED. The program will focus on building teacher knowledge around the core content standards, with an integration of social emotional learning. The grant will be used to plan and develop training materials for the 2019 Pasco Standards Summer Institute and deliver the Summer Standards Institute training for teachers. The 2019 Summer Standards Institute will take place while schools are closed, so teachers can attend and begin to embed their deepened learning into their planning for the 2019-2020 school year. The goal is that by the end of the 2019-2020 school year at least 50 percent of Pasco County instructional staff who attend the 2019 Summer Standards Institute will demonstrate evidence that they are planning,delivering, assessing and monitoring standards-based instruction matched to the rigor of the standards as demonstrated by rigor walk-through results, standards-aligned curriculum, and assessment resources. If teachers meet this goal, there will be an increase in student achievement and teacher effectiveness asdemonstrated by student state assessment reports and teacher evaluation data. Follow us on Facebook, www.facebook.com/pascoschools, and Twitter, www.twitter.com/pascoschools. Land O’ Lakes, FL – (December 12, 2018) – Superintendent Kurt Browning announced that Maintenance Area Specialist Mike Witfoth is the Pasco County Schools Non-Instructional Non-Bargaining (NNB) Employee of the Year during today’s quarterly district employee recognition ceremony. 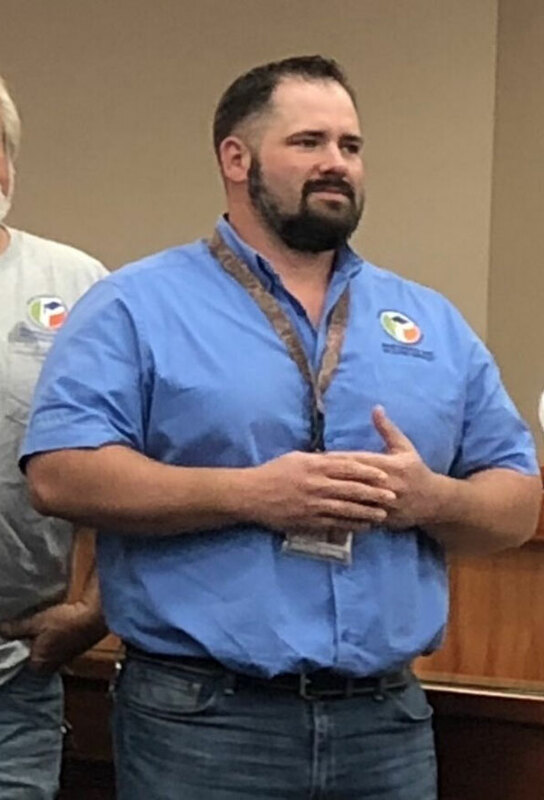 Mr. Witfoth was at the ceremony being recognized with 20 of his Maintenance Services Department colleagues for volunteering to spend a week in Bay County helping Bay District Schools recover from Hurricane Michael. The group was recognized with the Superintendent’s Teamwork Award. Mike has lived in Pasco County all his life and graduated from River Ridge High School. Shortly after graduation, he started his17-year career with Pasco County Schools as a maintenance assistant at the Northwest Bus Garage. That’s where he learned the importance of teamwork. He then went to work in Maintenance, learning the trades of fencing, flooring, and welding. After earning his certification as a master custodian, he was hired as assistant plant manager at Pine View Elementary School. A year later, he was promoted to plant manager and helped open Connerton Elementary School. Mr. Witfoth continued his ascent within the Maintenance Services Department six years later when he was promoted to his current position of custodial area specialist. He oversees 25 elementary school plant managers and works alongside them to achieve the highest standards of cleanliness. Mr. Witfoth will be honored with other employees of the year at a dinner ceremony on Tuesday, February 26, 2019. The district also will nominate him for Florida NNB of the Year. Link: Video of Superintendent Kurt Browning announcing NNB of the Year. 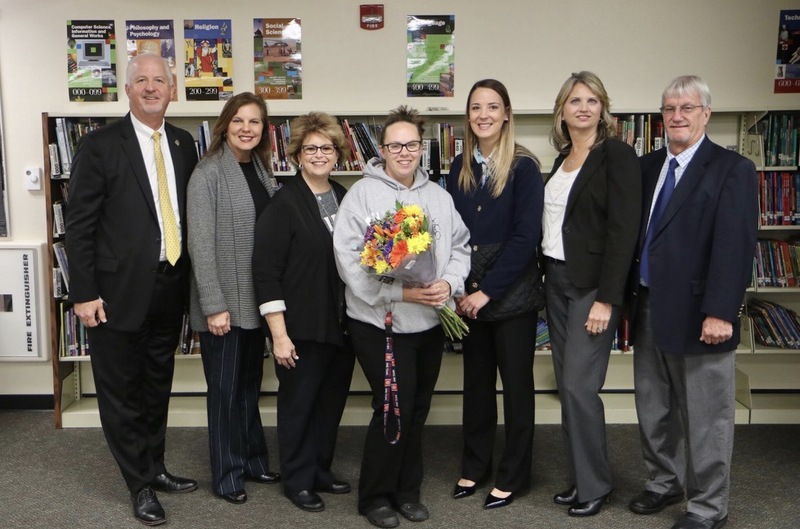 Zephyrhills, FL – (December 11, 2018) – Katie Jeffcott, resource management associate at R. B. Stewart Middle School, received the surprise news this morning that she is Pasco County Schools SRP of the Year. Superintendent Kurt Browning, Assistant Superintendent for Middle Schools Marcy Hetzler-Nettles, School Board Member Megan Harding, R. B. Stewart Middle School Principal Shae Davis, Pasco Education Foundation Executive Director Stacey Capogrosso, and United School Employees of Pasco President Don Peace announced the news and presented Mrs. Jeffcott with balloons, flowers, and a tin of cookies. “Are you serious?” Mrs. Jeffcott asked Superintendent Browning when he told her that she was SRP of the Year. She then gave him a big hug. Mrs. Jeffcott started her career with Pasco County Schools nine years ago as a food and nutrition assistant at John Long Middle School. She has been at Stewart Middle for the last six years. Her primary responsibilities include all the inventory, distribution, maintenance, and repair of the school’s technology. Katie coaches cheerleading, soccer (boys and girls), and track. She continuously volunteers at Stewart Middle outside of her coaching responsibilities, including with National Junior Honor Society (NJHS), dances (where she is often the DJ), and fundraising for school and community projects. She serves on several school committees such as 8th grade, technology, and school safety. Katie has created and coordinated several programs such as alternative field day, intensive math rewards, 6th and 7th grade carnivals, and spirit week. She also coordinates pep rallies and book fairs. Recently, Katie and the school’s NJHS came to the rescue of the local Meals on Wheels program after several robberies left them short of donations. The NJHS kids raised $1,200 with a trash-a-thon, collecting garbage throughout the community and receiving donations based on how much they collected. Katie and the students presented the check to Meals on Wheels in early November. She also partners with Thomas Promise, Relay for Life, and Angel Tree. Mrs. Jeffcott will be honored with other employees of the year at a dinner ceremony on Tuesday, February 26, 2019. The district also will nominate her for Florida SRP of the Year. Photo: Superintendent Kurt Browning, Assistant Superintendent for Middle Schools Marcy Hetzler-Nettles, R. B. Stewart Middle School Principal Shae Davis, Katie Jeffcott, School Board Member Megan Harding, Pasco Education Foundation Executive Director Stacey Capogrosso, and United School Employees of Pasco President Don Peace.